What she loves about dentistry: I love everything about dentistry. I love learning and experiencing new things and Dentistry is an ever changing environment. I love seeing the parents bring their little ones in for their very first visit to seeing the long term patients that come faithfully every six months. My favorite part of this profession is working with the patient; from the phone, to the minute they walk in the door, till they leave the office. Our patients and staff are "The Cream of the Crop". Personal Information: I was born in Pikeville, Kentucky where my Dad was a grocery store manager for Kroger and my Mom was a Registered Nurse at the local Hospital. We were then transferred to Logan, West Virginia when I was five years old. Finally, we were transferred to Melbourne, Florida where I was raised. I met my husband in High School; we graduated and went our separate ways. I went to college and he joined the USMC in 1996. After college, I became a flight attendant with U.S. Airways. Following the attacks of 9/11, I lost my position as a flight attendant. I then realized that God had more in store for me. He wanted me to pursue my original plan in the dental field. I received a position as an Office Administrator in Florida and worked that position until I reconnected with my husband and he asked me to relocate to North Carolina. I married Joe in 2004 and in 2005 we gave birth to our first and only child, Peyton. It is amazing how one little person can bring so much pride and joy into our lives. We also have four fur babies and several backyard chickens. My Motto: LIVE life to its fullest, LAUGH as much as you can, no one can dislike a smile, LOVE as much as your heart will let you, it should be for an eternity. Achievements: Occupational Safety and Health Administration Trained; Cardiovascular Pulmonary Resuscitation and Automated External Defibrillator Certified through the Red Cross; Specialized training in Invisalign and Implant Dentistry. 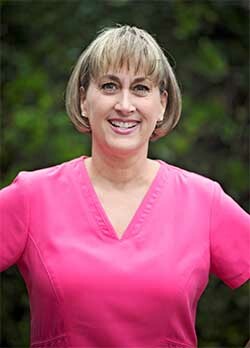 What she loves about dentistry: The personal bonds and relationships you develop with your patients are so wonderful. You feel so touched when they come in and ask about your children, the knowledge that you have seen a lot of children grow up and become adults. Those adult patients now are bringing their children to us for care too. I love that dentistry is a profession where I am continuously learning new products and techniques through continuing education that in turn will help my patients in their dental care. Personal Information: I was born in Lonoke, a small town 20 miles from Little Rock, Arkansas. During my last 2 years of High School I worked after school and on Saturdays for one of the two dentists in our little town. I enjoyed the work so much that when I graduated I started working for an Orthodontist for two years as I continued my education in dentistry. I realized my passion was in general dentistry after getting my CDA and worked in Little Rock for 20 years. 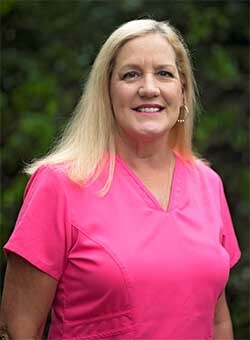 Since moving to NC, I have worked at Family Dental Care NC for 21 years. I have a beautiful daughter that attends college in Raleigh. I consider the people in our dental office my second family and can’t imagine being anywhere else but here in Coastal Carolina. Achievements: Cardiovascular Pulmonary Resuscitation and Automated External Defibrillator Certified; Occupational Safety and Health Administration Trained; Attend Continuing Education courses throughout the year. 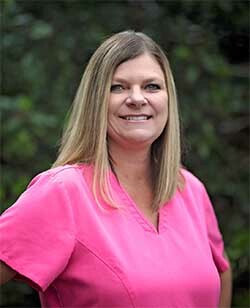 What she loves about dentistry: I enjoy working with the staff. We work together as a team. We strive to provide a friendly atmosphere for our patients. I enjoy interacting and listening to patients share their life stories. Children are always welcome and have a fun game room to play in. Our #1 goal is to put our patients first and to provide the best dental care. I love to clean my patients' teeth and to educate them on the importance of good oral hygiene. I want to help everyone I can to have a pretty smile and to be proud to show it off. Personal Information: Born and raised in Jacksonville, North Carolina. I have two daughters and a Maltese. Achievements: Occupational Safety and Health Administration trained; Cardiovascular Pulmonary Resuscitation and Automated External Defibrillator Certified; Attend Continuing Education courses throughout the year. What You Love about Dentistry: The professional and personal relationships which are created. Dentistry has been my career choice since I was a thirteen year old girl. At the time, I really didn't know what was in store for me or how much I would truly love my career. Ultimately my desire to help people remained true, what I didn't realize was how important these people and their families would be to me. Yes I help them in maintaining optimal dental health, but in the 29 years I have been a Dental professional, many people have touched my life. I can only hope that I too have impacted their lives, not only through educating them about their oral health but through shared interaction. Personal Information: I have been a resident of North Carolina since November 1990. I am the proud mother of two teenage daughters. They are the love of my life and I can only hope that they will find great pride and enjoyment in whatever career paths they choose. Achievements: OSHA trained; CPR certified; Attend Continuing Education courses throughout the year. 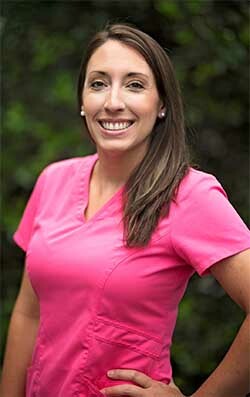 What She Loves About Dentistry: I love that dentistry is a career that has a continuous relationship with patients year after year. Dentistry has been an interest of mine ever since I was in high school. I am so glad to be a part of such a great dental team who I consider to be family. 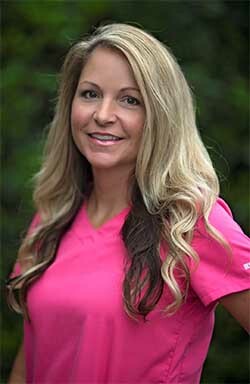 Personal Information: I grew up in SC where I started my dental career as a dental assistant. I moved to Arizona and California for a few years and returned to NC where I consider home now. I am married and have two children and my sweet bulldog Daisy Lou. 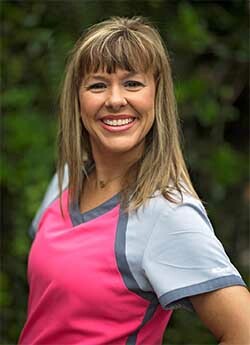 What She Loves About Dentistry: I love meeting new people and hearing their stories. I also love educating my patients and teaching them how to improve their oral health. We have a big military community in this area and I really enjoy meeting all of the military families and hearing about all the places they’ve been. Personal Information: I moved here to North Carolina in 2004 after marrying my husband. We have two daughters and two dogs. We love the coastal atmosphere and lifestyle here in NC. My husband retired from the Marine Corps in 2016 and we have decided to stay and raise our family.